Helping Heart Families » Caleb - Gavin's Got HeartGavin's Got Heart - Our mission is to spread congential heart defect (CHD) awareness while offering support to families with children affected by CHDs. JOIN OUR MAILING LIST! Get e-updates, special promotions and important information by email! Caleb was born on July 21, 2014. He was diagnosed in utero with HRHS, TGA, COA, Tricuspid Stenosis, ASD and VSD. Two days after birth, he received his stage I Norwood Procedure at Boston Children’s Hospital. In January of 2015, he returned to Boston to receive what turned out to be a successful Bi-Directional Glenn (stage II) repair. Caleb is scheduled to have his third surgery (either a modified Fontan or 1 ½ ventricle repair) in April. Caleb’s mom and dad are so amazingly proud of his strength and determination over the past few months, as he has learned to crawl, walk, run, and climb up stairs. He’s learning to speak so wonderfully, saying “mommy”, “daddy”, “hi”, “bye”, and “cookie”, just to name a few words. 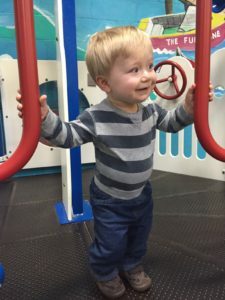 Caleb continues to be a source of inspiration to his parents as all three of them focus on a healthy, happy, and limitless future for their incredible little boy.